The fear of rats and mice musophobia is a common phobia as many people associate these rodents with food contamination. They are actually quite smart little creatures if you watch them, as many animal behavioral psychologists conducting laboratory experiments will affirm - not to mention the children who love their little pets - training them to do all sorts of clever tricks. 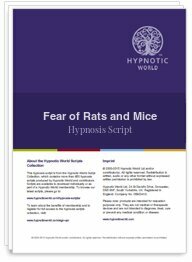 Whilst we don't advocate inviting rats and mice to run rampant in your home, if you or your client has an extreme fear of rats and (or) mice and it is interfering in your life in any way, then this hypnosis script can help you to overcome it. Most fears are either learned or exist as a result of some earlier experience. Once the fear has taken root in the subconscious mind we must address the subconscious to release this fear, in order for you to get on with your life - perhaps even developing a curiosity about these creatures.